Thirty one year old succumbed to typhoid fever in 1898, and was said to have haunted Saratoga's Pine Grove in 1952. Reubena Hyde Walworth tended to Spanish-American War veterans. In August 1898, the United States government opened Camp Wikoff at Montauk, Long Island, for soldiers returning from the Spanish-American War in Cuba and Puerto Rico. The camp had a primitive field hospital flying a yellow pennant to signify contagious diseases. An estimated 80 percent of the soldiers were ill with contagious diseases such as yellow fever, diphtheria and typhoid fever. During that summer, Camp Wikoff received over 29,000 Spanish-American war veterans, and a nurse from Saratoga Springs volunteered to tend these soldiers. She was Reubena Hyde Walworth. Ruby, as she was called by her family, calmed the soldiers, cooled their fevered brows, and in many instances, hers was the last face they saw before they died. An impressive tribute to Reubena Walworth is her grave at Greenridge Cemetery. More than 50 years later, on an evening in 1952, at Pine Grove, the Walworth ancestral home in Saratoga Springs, Clara Grant Walworth was dying. She was the last descendant of a prominent Saratoga Springs family and the only niece of Reubena Hyde Walworth. In her final hours, Clara was attended by a nurse and Evelyn Barrett Britten, a friend and local historian. Britten, the author of Chronicles of Saratoga, described Clara’s death as almost a phantasmagoric event. “Who was that?” the attending nurse inquired. Was it the self-sacrificing Reubena, returning to nurse and say goodbye to her niece? A specter? Or just the vivid imagination of a devoted friend and historian? Reubena Hyde Walworth was a member of an illustrious family that resided in Saratoga Springs for over 100 years. Her grandfather and namesake, Reuben Hyde Walworth, was a New York State chancellor, the highest judicial position in the state at the time. Her mother, Ellen Hardin Walworth, was the daughter of an Illinois politician who was a Mexican war hero. She was a cousin of Mary Todd Lincoln and an early preservationist who helped save Mount Vernon, George Washington’s home. 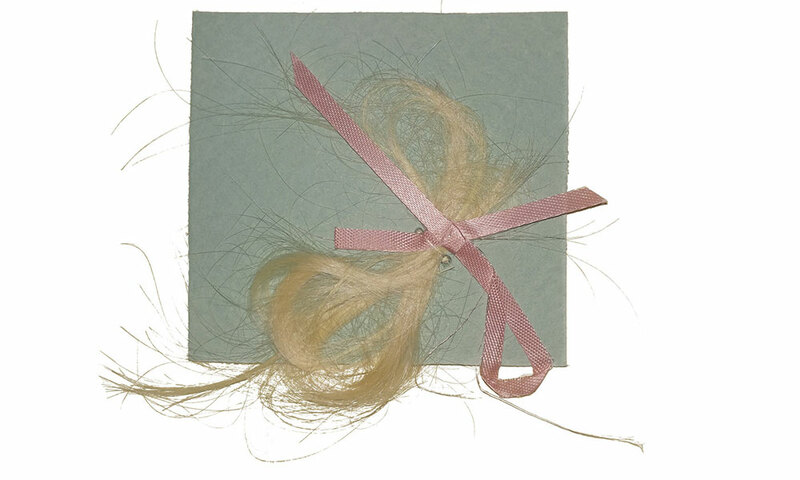 A lock of Reubena’s hair from her mother’s private diary. Reubena’s mother, Ellen, instilled a sense of patriotism and love of serving one’s country in her daughter Ruby, the second youngest of her five living children. Ellen, who was a historian, educator, writer, civic leader and one of the founders of the Daughters of the American Revolution, called Ruby “my little Puritan” for her simple fashion and manners. She was her mother’s constant companion. Ruby’s father, Mansfield Tracey Walworth, a lawyer and novelist, was described as an alcoholic, and a madman who provided little or no emotional and financial support to the family. When Ruby was 6 years old, her eldest brother, Frank, committed patricide, to protect his mother and little sister from the threats and ravings of this mad husband and father. Young Ruby was raised in a home of mental illness and domestic abuse. Despite all this, Reubena was remembered as sweet, reserved and artistic. 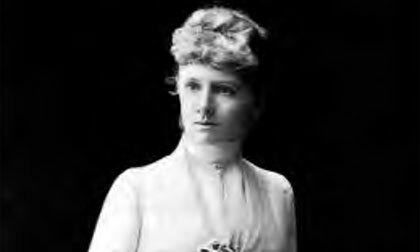 She was an 1896 graduate of Vassar College, where she was class poet; a student of the Art Students League of New York City; and an advocate for women’s suffrage. Reubena’s death had a great impact on many, including the veterans whose lives she touched. They wrote to her mother describing her compassion. 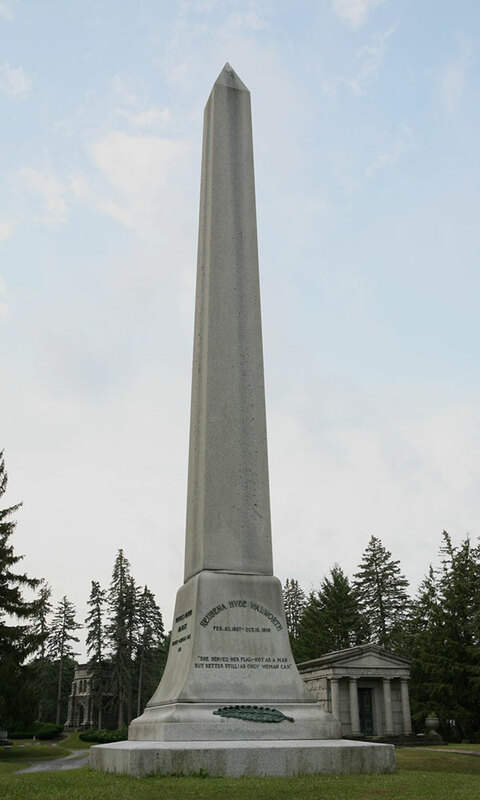 The Daughters of the American Revolution erected a monument in her honor at Greenridge Cemetery in Saratoga Springs.